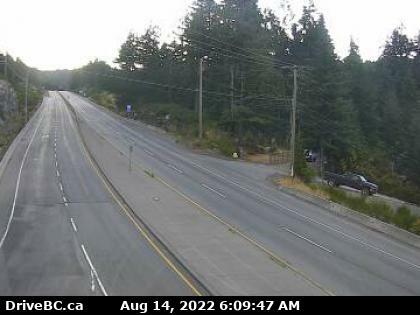 The Malahat is the term commonly applied to the Malahat Drive (or, as it is more frequently known locally, "The Malahat Highway" - a 25 km (16 mi) portion of Highway 1 running along the west side of Saanich Inlet - and to the region surrounding it. The Malahat begins in Goldstream Provincial Park, just north of Langford, and takes a famously winding and steep route over the 352 m (1,155 ft) Malahat Summit to end just south of Mill Bay. The only major, paved route linking Greater Victoria to the rest of Vancouver Island, the Malahat was completed in 1911 as a single-lane gravel road, hugging the steep cliffs above Saanich Inlet. Even after becoming a major thoroughfare, its sharp and abrupt curves, and winding descent made the road notorious for traffic accidents. Many early automobiles succumbed to flat tires, broken axles and ruined engines. In recent decades, the highway has been greatly improved, widened, and straightened though concerns for traffic safety and highway closures persist. The route is also famous for its scenic vistas of the Saanich Peninsula and Saltspring Island, and a number of rest stops have been developed to allow travelers to stop and enjoy the views. Off the highway, the Malahat area consists of rugged, steep slopes of largely second growth forest. Douglas-fir, arbutus, hemlock, and western red cedar predominate.